Extra cellular hyphae traveling in-between plant root cells. Penetrated cell with a formed arbuscule (top right). I have recently been appointed to teach two classes of environmental biology in the upcoming semester at my alma mater, Buffalo State. In the wake of putting together two separate college level courses on the subject, (one is an online course) I have been thinking a lot about the bigger picture. Climate scientists agree, humans are putting more and more carbon into Earth’s atmosphere. This alteration of our planets chemistry has a pervasive influence on many Earth processes. A few months ago, I came across a 2014 study that looked into how fungal mutualisms are enhanced with the elevated CO2 concentrations. In a blog post, I explain what the researchers did and how the plants response translated to the fungal community. In that stimulating 2014 paper, I had learned that ectomycorrhizal plants along with their specific ectomycorrhizal fungi (ECM) diversified during the Cretaceous. We know that humans are enriching atmospheric carbon at a ridiculous rate, with carbon reaching 400 parts per million (ppm). Though, when these plants and fungi started dominating Earth’s landscapes, atmospheric carbon was between 1100 and 1700 ppm!! Using a manipulative experimental design, these researchers compared plants growing in prehistoric atmospheric conditions and plants growing in the present atmosphere. With a higher carbon availability, these researchers found that plants photosynthesize more efficiently. Three AMF hosts in the 2014 study. Ginkgo biloba, Sequoia sempervirens and Magnolia grandiflora followed by two ECM hosts, Pinus sylvestris and Betula pendula. (f) AMF structures. (g) ECM rootlets. Quirk et al. 2014. Sometimes a key enzyme involved with photosynthesis (RuBisCO) grabs an oxygen instead of a carbon dioxide. 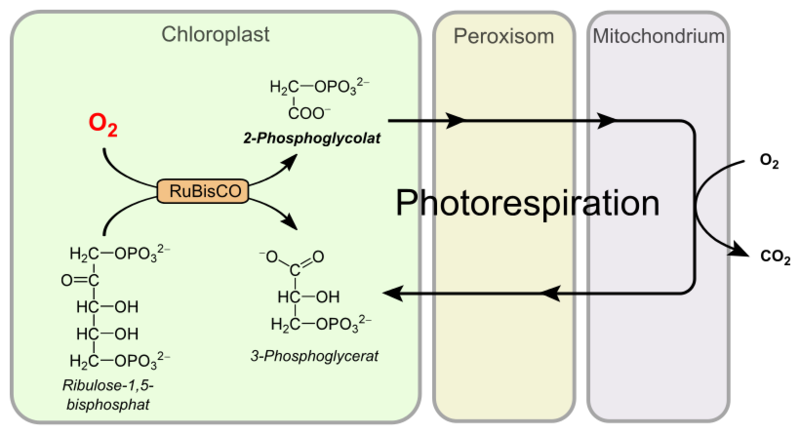 This causes the photosynthetic machinery to misfire, in a process called photorespiration. In C3 plants, this misfiring reduces sugar production by 25%! That’s an enormous amount of energy, taking into consideration of the plant communities that cover the Earth. With this, one can see that a prehistoric atmosphere with markedly higher levels of carbon dioxide would have plants misfiring less, ultimately enhancing sugar production. In the 2014 study, this is exactly what they found. A photosynthetic misfire; photorespiration is costly. The plants grown in prehistoric conditions produced more sugar, and allocated more sugars to underground mycorrhizal symbionts. ECM fungi that was fed more sugar from the higher functioning plants produced more enzymes. These voracious, well-fed fungi eroded their parent material and mobilized more locked up nutrients faster than what we see in today’s ecosystems. When I published this initial information, readers were asking if this is good or bad, and here is my response; neither. It was simply different. Carbon cycling is not a steady state kind of process but a complex interaction involving living structures like primary producers and their fungal symbionts, as well as abiotic factors like temperature, moisture, and now we can say atmospheric chemistry. f you didn’t read the aforementioned post, this is probably really cool, thought provoking information. Those who have read the article might question why I’m recapping those 2014 findings. Well, I just came across a paper that was published in October of this year, that too looked into the influence that enhanced concentrations of CO2 has on mycorrhizal communities. This recent study focused not on ectomycorrhizal plants, but on plants that form mutualisms with arbuscular mycorrhizal fungi (AMF). Additionally, in this 2017 study, they examined how plants grown in elevated CO2 concentrations interacted with AMF over multiple “generations”. This new research helped me understand the intimacy of mycorrhizal relationships. A single plant root can be colonized by a diverse array of fungi. Unlike ECM, AMF grow exchange structures within plant root cells called arbuscules. A handful of studies since 2010 have shown that plants can supplement more sugars to symbionts that provide them with more soil nutrients. The distinct sending of photosynthate to better symbionts is even more localized in AMF relationships, because these fungi are actually inside the plant cells. The three fungal structures formed within plant roots. Gijsbert Werner and his team grew the Mediterranean plant Medicago truncatula in three different atmospheric treatments; low CO2 (160 ppm), ambient CO2 (490 ppm), and elevated CO2 (750 ppm). These plants were inoculated with either one, or both of two species of AMF, Glomus aggregatum and Rhizophagus irregularis. Compared to Rhizophagus irregularis, Glomus aggregatum is known as a weaker symbiont, because instead of delivering the large quantities of phosphorus it mines from the soils it inhabits, its stores much of it into a non-accessible poly-P form. Like the first study I referenced, both species of AMF were enhanced by elevated levels of CO2. Again, the more carbon available in the air, the fewer times photorespiration occurs, and more sugars can then be allocated to the fungi living beneath the forest floor. The “generations” of subsequent plants were all grown from the same batch of seeds, so instead of viewing the evolutionary responses of the plants, only the shifts in the mycorrhizal community were observed. Each “generation” of plants were introduced to 1.35g of mycorrhizal root fragments from previously grown plants inoculated with both species of AMF. With enhanced atmospheric CO2, the plants had a better ability to select superior mutualists. This plant mediated selection is best explained through the plants value of carbon. When atmospheric carbon is scarce, soil nutrients become less valued, thus reducing plant incentive to select higher functioning mycorrhizae. On the contrary, when CO2 is in high abundance, soil nutrients are in high demand, so the value of mycorrhizal services increases. This is a clear feedback, as these plants that produce more sugars can send those sugars to the most beneficial fungi, that send the plants more nutrients, activating even more sugar production. Plant selects more functional mycorrhizae as function of enhanced CO2 concentration and subsequent plant generations. Werner et al. 2017. As we continue to modify Earth’s atmospheric chemistry, we can predict how ecological and evolutionary processes beneath the forest floor will be influenced. Plants will produce more sugars, and have a stronger preference for higher functioning symbionts. Future plants will not only have a stronger selection on mycorrhizal communities, but will make them more enzymatically active. These plant influences may ultimately alter the way carbon is cycled, and the ecosystems present today might soon mirror systems from Earth’s distant past. What these ecological and evolutionary intricacies entail for fungal diversity is really unknown.